BrahMos Aerospace celebrating 15th anniversary of the signing of Inter Governmental Agreement for the formation of BrahMos Joint Venture. Defence Minister A K Antony along with Dr. A S Pillai, CEO & MD, BrahMos Aerospace. A K Antony was the honourable Chief Guest at the grand occasion. Dr. A Sivathanu Pillai giving welcome address during the Aardhik Diwas - Partnership Day celebration on 19th February, 2013 at BrahMos Hqs, New Delhi. Air Chief Marshal NAK Browne, Chairman COSC & Chief of the Air Staff congratulating BrahMos for such a successful joint venture. Defence Minister A K Antony releasing Coffee Table book highlighting the remarkable journey of BRAHMOS. 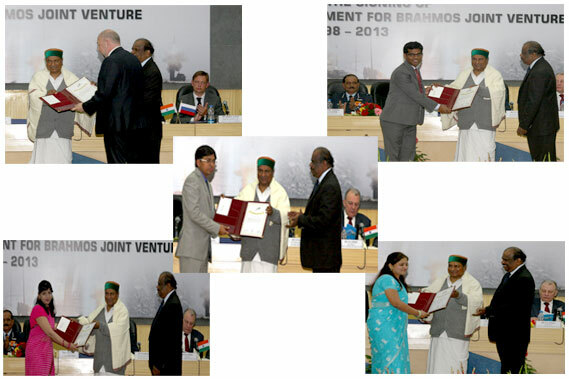 Mr. Vadim A Merkulov, Chief Missile Designer, receives BrahMos Excellence Award 2012. Mr. P K Biswas, Chief Consultant, receives BrahMos Excellence Award 2012. Best Innovation Award was conferred to Mr. Ivan A Belousov, Mr. Dimitry Yu Mukhachev & Mr. VSN Murthy (in picture) as a team. Godrej & Boyce wins Best Industry Award. Godrej has been associated with BrahMos since 2001. National Chemical Laboratory, Pune wins Best Laboratory Award on 19th February, 2013, during the celebration of 15 years of BrahMos JV, at BrahMos Hqs, New Delhi. BrahMos Aerospace on 19th Feb, 2013 felicitated five of its young and dynamic scientists with BrahMos Young Scientist Award. Sagar Dutta, winner of Innovative Ideas in Science & Technology competition (organised by brahmand.com) being felicitated by A K Antony and Dr. A S Pillai during the Aardhik Diwas - Partnership Day, New Delhi.